This year our Battle of The Bands resulted in two winners sharing the top prize: young flautist Daniel Shao and new contemporary ensemble The Hermes Experiment. Judged by a panel of musicians in the scene, Radio 3 producers and the Nonclassical team, we were really excited to meet them and look forward to working with them in 2014. The Hermes Experiment is a newly formed ensemble of four young professional musicians passionate about contemporary and experimental music. 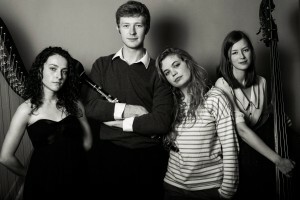 The band members Héloïse Werner (soprano), Oliver Pashley (clarinet), Marianne Schofield (double bass) and Anne Denholm (harp), met whilst studying music at Cambridge University. Capitalising on their deliberately idiosyncratic combination of instruments, the ensemble performs a variety of experimental compositions and arrangements, as well as live free improvisation. The Hermes Experiment also seeks to promote and collaborate with composers, regularly commissioning new works for the ensemble. Future plans include performances at Kettle’s Yard and the Fitzwilliam Museum, Cambridge, at St Peter’s Church, Notting Hill as part of this year’s Notting Hill Mayfest and a tour to France, featuring a new commission by composer Giles Swayne. Here they are featured in this month's Taking Notes podcast. On June 5th we will welcome them to perform at our monthly Nonclassical event at the Shacklewell Arms, where among other repertoire, they'll be performing a new commission from Ed Scolding, who won our composition competition in November 2013.